Be the first to hear about their new releases and deals. Download the Booksprout app and search for Kate Reedwood today! Kate Reedwood is a mild-mannered manager by day. At night, she trades in her high heels for bunny slippers and lets her imagination run wild. 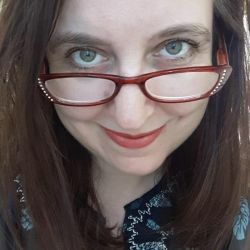 A trained artist and writer, Kate enjoys writing stories that combine humor with strong characters who know what they want and aren't afraid to go get it. Every story is an emotional journey where the characters must struggle to find their happily ever after. But they do always reach it in the end, no matter the time or place in the universe. She lives off of coffee and dreams and enjoys going for walks along the shores of Lake Ontario, taking pictures of whatever catches her eye. A romantic at heart, she loves to snuggle under a blanket with a good book to warm up the cold Canadian winters. When not dreaming up new worlds and books to write with Australian author Chris Heinicke, she can most often be found enjoying the quiet company of her husband and son.